Extended periods of walkaway operation are essential to the work carried out by Spanish energy producer Repsol, which relies on two Freedom EVO® platforms and Tecan’s 350µl nested liquid handling disposable tips for its research into alternative energy sources. Scientists at the Madrid Technology Center of global energy company Repsol are engaged in research to develop fossil fuel alternatives, such as advanced biofuels. More than 400 researchers and scientists work together at the center to improve the value of the energy chain through technological innovation, contributing to a safer, smarter and cleaner energy model. To help drive this research forward, the company has invested in two Freedom EVO platforms for colony picking and enzymatic assays, relying on nested disposable tips to achieve the extended walkaway times required. The biotechnology department’s Freedom EVO platforms are central to its research. 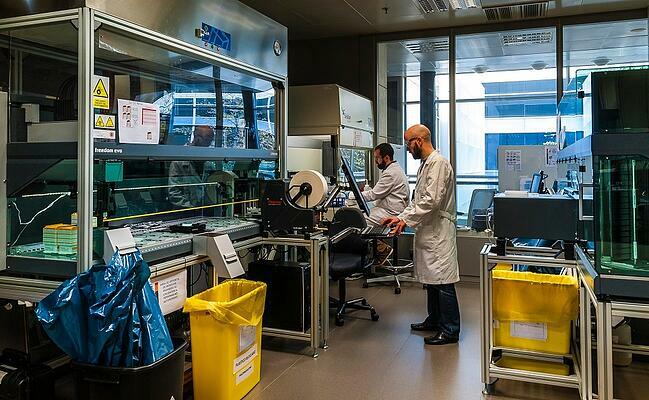 Jose Miguel Seoane, a researcher in the biotechnology department, explained: "The investigation of new biological applications involves screening large numbers of mutants of different micro-organisms, enabling the best performing candidates to be selected for further studies. As we test thousands of different mutations, automated high throughput screening is the key to our success." Jose continued: “We start by targeting a particular molecule, using standard microbiological methods to produce it in the laboratory. At the same time, our computational team is performing thousands of calculations, exploring all the possible mutations and modifications of the selected enzyme or biological pathway to establish what is likely to generate the greatest possible yield. These results are implemented in the laboratory, creating thousands of clones which must be explored to see whether they perform as expected. “Automation is vital for this work; the clones are isolated on a Freedom EVO workstation equipped with a colony picker (Pickolo™, SciRobotics), Robotic Manipulator (RoMa) and Liquid Handling (LiHa) Arms, 350 µl Tecan Sterile nested LiHa disposable tips, a plate sealer and a carousel for petri dishes (SciRobotics). Petri dishes containing the colonies are stored in the carousel and the mutants harvested using the colony picker. After transfer to a microplate, overnight incubation allows the mutants to be grown separately in individual plate wells prior to performing enzymatic assays on a second Freedom EVO system. This instrument is equipped with a RoMa Arm, a MultiChannel Arm™ 96, 200 µl Tecan Sterile disposable tips – standard and nested – three Teleshakes (INHECO), a Te-VacS™, a 10-plate hotel, a Tecan Carousel and an Infinite® 200 PRO microplate reader, as well as Magellan™ data analysis software. The target protein is extracted, and enzymatic assays are carried out to determine whether the modification introduced makes a difference or not. Of particular interest to us was the availability of nested LiHa disposable tips. We generate up to 10,000 colonies per week, and long periods of walkaway automation are absolutely essential. “We looked at systems from several companies before choosing the Freedom EVO,” said Jose. “I had used Tecan systems in my previous employment and had been very happy with them, and the Freedom EVO is very well tested with a proven track record. The company also offers excellent support, and had the advantage of being able to provide a colony picking workstation and a high throughout platform. Of particular interest to us was the availability of nested LiHa disposable tips." “We have had the Freedom EVO systems for about a year now, and choosing them was a good decision. It would be almost impossible and extremely complicated to do this work manually. Automation is much more precise, giving us total control of the process, with traceability provided by barcodes. We have developed robust Freedom EVOware® scripts that are straightforward to use and, by running the enzymatic assays overnight, gain 10 to 12 hours as the samples are ready for us to use in the morning. The support from Tecan is excellent; the field engineers know the systems well and are very responsive, which we really appreciate as a project can be set back weeks, or even months, if the support is not there. It was a pleasure to work with the company,” Jose concluded.